The passing of Professor Pemmaraju Venugopala Rao may be a great loss to the community, but his life, says Dr. Bhagirath Majmudar, was a masterpiece that must be celebrated more than mourned. Yes, Dr. Rao can be aptly described as a masterpiece. He compressed in his life of 80 years a variety of divergent and unique elements such as theatre, painting, physics, astrology, astronomy, Hindu mythology, Telugu literature, and public leadership. He fastened all these elements together with a fabric of common life which we all live. This enriched his tapestry with a singular splendor. Dr. Rao’s wisdom came from vast information and profound knowledge. I do not say this because of a human etiquette to adore and admire the dead. He has heard this many times and from many of us during his life. Exactly one month before his death, while celebrating his life in the Hindu Temple of Atlanta, we shared our love and respect for him. “How easily approachable he was, how ingeniously helpful, and how he and his wife Laxmi Rao opened their house to anyone at any time,” were the common comments that surfaced in this fortuitous communion. At this meeting, Dr. Rao also reviewed his life autobiographically. It was a swan song recognizing a number of people that had an impact on his life. He paid tribute to his galaxy of gurus beginning in India and ending in this country, a variety of his friends and mentors that he met, his two daughters Nalini and Saleena, and grandson Joseph. There he finished his final thanksgiving. “I am a part of everything I met,” wrote Tennyson, the poet. Dr. Rao’s message would be that everyone needs to remember that the house in which we live is supported by many bricks, each brought there by a number of different people. In summarizing a life we often talk about a loss that the death leaves behind. It is more helpful, however, to ponder on the pluses that are ours to emulate. The dead often leave a legacy that invigorates the life of the survivors. Dr. Rao that way could never be dead. “That I am here and he is there is a fundamental delusion,” says the Zen Master Yasutani Roshi. A demise should be punctuated by promise. Dr. Rao was a polymath who had versatility of wings and feet coordinated with extreme efficiency. In my countless encounters with him he never said he had no time. “The butterfly does not count years but moments, and has time enough,” said Rabindranath Tagore. He unhesitatingly accepted new, arduous challenges and handled them while his life was in full current. When challenges receded, he lighted his own fires. His command of English and Telugu languages gave us an advantage of two visions of life. Each language brought a separate current of culture. He was the editor of all publications emanating from Vanguri Foundation of America, an organization dedicated to Telugu literature. As a painter, his palette held a wide range of colors, reflecting his many interests. His paintings on display at his memorial service were evidence of that. 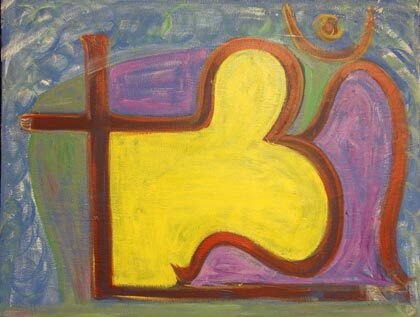 One particular piece of art, which bridged together a Cross and an Om sign, showed his wide, all-encompassing views of interfaith connections. “The artist brings something into the world that did not exist before, and he does it without destroying something else,” said John Updike. Dr. Rao was a religious teacher without being a priest. He was the first president of the Indian American Cultural Association (IACA) when it was officially formed, and was principally involved in writing its constitution. He was an avid and eloquent parliamentarian keeping the house in order during IACA meetings. He was an inspiring teacher who not only trained generations of undergraduate and graduate students at Emory but also undertook the challenging task of teaching science to Tibetan monks under the auspices of Emory University. He was the stage producer when, in 1975, the Ramayana was presented in Atlanta as a classical dance drama. The life of such a Renaissance man offers us points to ponder. I often wonder if we are pushing our children too much towards science and technology without opening a window to humanities and art. Life is a thousand-petal lotus and we have to inspire and encourage our future generations to open as many petals of this lotus as they can. A fully blossomed life is a true measure of its success and happiness. We have to strive to combine life with livelihood to produce a community with vibrant culture. In the end, I will quote Guru Nanak, who said, “Death would not be called bad, O people, if one knew how to truly die,” or how to truly live, like Dr. Rao did. Bhagirath Majmudar, M.D., is a Professor of Pathology and Associate Professor of Obstetrics and Gynecology, Emory University School of Medicine, Atlanta, Georgia.